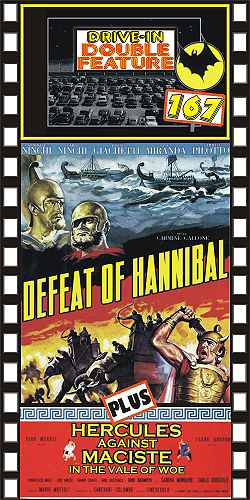 DEFEAT OF HANNIBAL (1937/1960) Annibale Ninchi, Camillo Pilotto, Fosco Giachetti, Francesca Braggiotti. A sprawling epic about the Carthage-Roman war. Lots of cool sword & sandal intrigue with big, awesome, battle scenes. Braggiotti almost steals the show as the beautiful, mystical queen. The lighting of her closeups is remarkable. The entire film is a top example of B&W cinematography at its atmospheric best. Likewise, the battle scenes’ choreography is superb, with thousands of extras (along with a plethora of elephants) all engaged in the structured battle formations of the time. Released here on TV in 1960. Cool! 16mm. PLUS: HERCULES AGAIN MACISTE IN THE VALE OF WOE (1961) Kirk Morris, Frank Gordon, Bice Valori, Liana Orfei. In this wacky sword and sandal movie, a couple of boxing promoters use a time machine to travel back to ancient times. They end up needing Hercules to save them from Genghis Khan and his Hordes. Nice color and print, 16mm.